JAERO was recently updated by programmer Jonti, and it now supports the decoding of AERO C-Channels which are voice audio channels that exist on both the L-Band and C-Band frequencies of AERO. AERO is a satellite based communications service used by modern aircraft. The information transferred are normally things like aircraft telemetry, short crew messages, weather reports and flight plans. 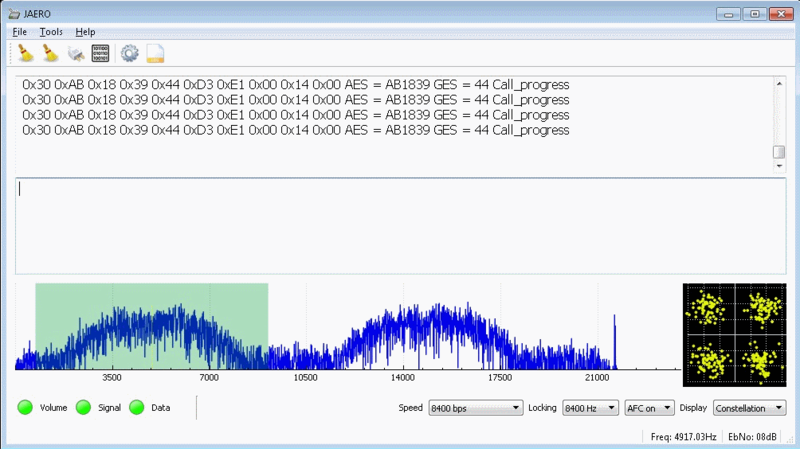 It is similar information to what is found on VHF/HF ACARS. Inmarsat C and in particular AERO C channels provide circuit switched telephony services to aircraft. The channels of interest are those that carry AMBE compressed audio at a channel rate 8400 bps and voice rate of 4800bps. There is also an older speech codec still in use, LPC at a voice rate of 9600 bps and an overall channel rate of 21000bps. Telephone channels are two-way duplex. In the from-aircraft direction transmissions are roughly in the 1646 to 1652 Mhz range. The satellite up-converts these transmissions to C band, similar to T and R channel burst transmissions. So it is possible to receive the from-aircraft transmissions although it is significantly more difficult than those in the to-aircraft direction on the L band. So for those who want to get started receiving these transmissions the L band is by far the easiest place to start. Another aspect of the C channels is that they most often use spot beams rather than global beams which makes it more difficult to receive transmissions for aircraft using a spot beam that is aimed at another region. However if you are inside the spot beam the transmissions are relatively easily received on L band. A 60 cm dish with an LHCP helical and L band LNA will provide excellent results but even with a patch antenna it can be done. Decoding these channels to audio in JAERO takes a little effort to setup. Due to the uncertain legal status of the digital audio AMBE codec, the codec code needs to be compiled manually first, and then placed into the JAERO directory. Jontio has uploaded the AERO AMBE codec source code at https://github.com/jontio/libaeroambe. Since JAERO is a Windows program, compilation of libaeroambe involves using MSYS2. Once fully set up with the audio codec, the audio will come out of default soundcard set in Windows audio properties, so ensure that any Virtual Audio Cables are not set as the default device. On the L-band link you can get conversations from the ground to the plane. The C-band link would get you the plane to ground side of the conversation too, but that is a challenging signal that would require a large dish and Jonti doesn't know of anyone who has managed to receive that before. Typically the conversation topics are things like Medlink which is a multilingual medical support line that can provide backup to doctors or aircrew handling medical emergencies in the air. In Europe the USAF also apparently use C-Channel. How does the “C Channel info/Channel Assignment” tab get populated? I`ve got some info in that tab when decoding one of the 10500 bps channels a few khz below the c-channels (98W satellite). The message that appears is something like “global beam call: channel 0”. In the c-channels, I’ve only got audio so far. Thanks, i will leave the program sitting on one of those channels for while and see what i can catch. Does the info stay in that tab after the program is closed and re-opened? I can answer my question now…the channel info is not retained after the program is closed. Yes, audio ok for me with patch antenna on lband. Not easy because very short audio log. Yes, I don’t get a 100% decode here. I noticed all the features mentioned by Jontio: sporadic transmissions in a number of adjacent channels, with variable power, sometimes the transmission seem to overlap preventing JAERO from getting a lock or decode. However, when I lock on an isolated high-power tx, I get audio decoded. Perhaps a better antenna or orientation could help. the RF power drops on the channel after initial contact to save power to the satellite. As for the channel overlapping you need a better antenna like a dish with a feed, in that way one signal (the beam that is geographically nearer to you) will be inevitably stronger thus more distinguishable from the other. I got it working in Linux (Debian 9) and I’m currently decoding to-aircraft audio around 1546.130 Mhz. Happy to help if anyone tries this on linux. Hi Uploaded compiled DLLs to share server. I used the howto posted by Kevin and program seems to be working with this libraries but i can not verify audio decoding now because I must better setup my SDR to better recieve signals on AERO C channel frequencies but it i will propably works just fine. thanks for the compiled codec, put them in the Jaero directory but it says libraries not found no audio? In the cmake GUI, check the ‘DISABLE_TEST’ or you will get lots of compile errors for gmock. Thank you for all your efforts ! The whole thing reminds me a little bit the original mess with tetra decoder wintelive but it s a breakthrough! nope. I had no issues building the jmbe file for sdrtrunk, but this jmbe is not building for me on linux. It’s as if something is missing. Finally getting strong decodes this morning, well done Jonti!! And a big thank you to Kotelnikov007! !